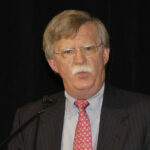 John Bolton is a senior fellow at the American Enterprise Institute. From August 2005 to December 2006, he served as the U.S. Permanent Representative to the United Nations, and for four years prior to that he was Undersecretary of State for Arms Control and International Security. Ambassador Bolton has a B.A. from Yale College and a J.D. from Yale Law School, where he was editor of the Yale Law Journal. He has written for numerous publications, including the Wall Street Journal, the Washington Post, and the Weekly Standard, and is the author of Surrender is Not an Option: Defending America at the United Nations and Abroad. The following is adapted from a speech delivered in Washington, D.C., on September 11, 2009, in the “First Principles on First Fridays” lecture series sponsored by Hillsdale College’s Allan P. Kirby, Jr. Center for Constitutional Studies and Citizenship. I think it is important, on the eighth anniversary of the 9/11 attacks, to take a look at our foreign policy and to judge whether or not we’re on a path to becoming safer. In doing so, we should not be intimidated by those who say that criticism of foreign policy—criticism that suggests we’re less safe as a consequence of certain policies—is somehow disloyal or hyper-partisan. It is the essence of political debate over foreign policy to judge whether the interests of the United States are being protected and advanced. If we believe they are not, it is our responsibility to speak out. For the last eight months, we’ve had a different kind of president than we’ve had in the past. Barack Obama is the first post-American president. And by this I don’t mean he’s anti-American. What I mean by post-American is suggested by a response the president gave to a reporter’s question during a recent trip to Europe. The reporter asked about his unwillingness to discuss American exceptionalism—the notion that the United States has a unique mission, that it’s “a shining city on a hill” as Ronald Reagan liked to say (echoing our pilgrim fathers). Mr. Obama responded that he believes in American exceptionalism in the same way that the British believe in British exceptionalism and the Greeks believe in Greek exceptionalism. Given that there are 192 member countries in the United Nations, I’m sure he could have gone on naming another 189 that believe in their own exceptionalism. But in any case, the idea that all countries believe themselves to be exceptional in the same way leads to the unmistakable conclusion that none are truly exceptional. In other words, the president’s response reflects his belief that America is not so different from other countries. Reagan was all about America . . . . Obama is ‘we are above that now.’ We’re not just parochial, we’re not just chauvinistic, we’re not just provincial. We stand for something—I mean in a way Obama’s standing above the country, above—above the world. He’s sort of God. This image of President Obama standing above his country and above the world sums up the post-American way of thinking. The practical point it makes is that America’s interest is no different or better than any other country’s interest. But is that true? Is America’s interest not superior to Sudan’s or Cuba’s or Zimbabwe’s? In line with this way of thinking, the Obama administration is pursuing a policy that can accurately be described as neoisolationist—a policy characterized by an unwillingness to be assertive in the world in defense of America’s interests and those of our friends and allies. This policy traces back in the Democratic party to George McGovern’s acceptance speech at the 1972 Democratic national convention. McGovern’s refrain was “Come Home America”—come home from Vietnam and come home from a lot of other places as well. This is the attitude that has come to dominate liberal foreign policy circles. Consider our current policy regarding Iraq. The Obama administration is determined to withdraw American forces along the lines of a plan formulated at the end of the Bush administration, but without regard to the actual situation in Iraq. American forces have pulled back from their prominent roles in the major urban areas, and violence has increased. But the administration remains fixed on the withdrawal schedule, because it is withdrawal—rather than the political stability of Iraq—that matters to it most. And this strict adherence to the exit timetable without regard to the political and military consequences could prove to be very harmful to our interests—not only in Iraq, but in the broader region as well. In Afghanistan, there is legitimate room for discussion about what our strategic objectives should be. I doubt we will transform it into a stable democratic society. It is not going to become Switzerland—or even Honduras. On the other hand, we have a serious strategic interest in making sure that the Taliban and al-Qaeda don’t use Afghanistan as a base to launch future terrorist attacks. But today, what was for years portrayed as the good war by liberals—as opposed to the “bad” Iraq War—has become just another war from which they want to get out. This is creating a difficult political problem for President Obama. And the path he chooses to take in Afghanistan is going to be significant, not least because of the consequences it will have in Pakistan. Our interests in Pakistan are even more acute than in Afghanistan, and the potential risks to the United States and to our allies even graver. The reason is that if radical Islamists are able to create enough chaos inside Pakistan to enable them to take control of the government, they will immediately come into possession of a substantial arsenal of nuclear weapons. This would lead to a greater risk of conflict on the Indian subcontinent and also increase the chance that these weapons will fall into the hands of terrorist groups. So our national interest is not simply preventing al-Qaeda and the Taliban from returning to their safe havens in Afghanistan. The cross-border nature of Taliban and al-Qaeda activities requires us to work even harder to ensure that Pakistan’s nuclear capabilities don’t fall into the wrong hands. More broadly, the Obama administration believes that its predecessor didn’t negotiate enough on issues like the proliferation of weapons of mass destruction. The president has said repeatedly—starting with his Inaugural Address—that the United States must hold out its hand to countries like North Korea and Iran in the hopes that they will unclench their fist and enter into negotiation. This reflects a curious view of history, since in fact the Bush administration negotiated directly or indirectly with Iran and North Korea for six-and-a-half years. But more importantly, it reflects a fundamental misunderstanding of the nature of negotiation. Negotiation is not a policy. It is a technique. It is a way of achieving our objectives. It doesn’t tell us what the objectives are. The emphasis on negotiation as an end in itself reflects a shallowness in this administration’s approach to international affairs, and gives us little confidence that our interests will be well served. The Obama administration has extended its hand to North Korea, only to see that country conduct another nuclear test, launch more ballistic missiles, and kidnap and incarcerate two American reporters. Kim Jong Il apparently didn’t get the message about the “reset button” when President Obama replaced President Bush. And in fact, Kim Jong Il will never be talked out of his nuclear weapons program, which he sees as a trump card against the United States, Japan and South Korea. It’s the ultimate protection for his regime, and it’s a source of revenue and leverage elsewhere in the world, particularly in the Middle East. On the other hand, the North Koreans have been very successful over the years in using negotiations to leverage economic and political concessions. They’ve even been happy to pledge to give up nuclear weapons—five times, by my count, over the past 18 years. But of course they never carry through. Sometime during the next year, North Korea will probably agree to negotiate. And why not? It’s to their advantage. It buys them time, it increases the possibility of further economic and political concessions, and it will fundamentally satisfy a U.S. administration whose supreme objective is negotiations. It won’t reduce the nuclear threat that North Korea poses to the world, but it will take it out of the media spotlight. And for this administration, that would appear to be as good as solving the problem. In Iran we see another example of the outstretched hand being slapped away. Indeed, there is now at least anecdotal evidence that the regime in Tehran saw the Obama administration as so eager for negotiations that it would overlook any harsh steps Iran might take internally. So in response to the administration’s friendly overtures, the mullahs in Tehran conducted a grossly fraudulent presidential election on June 12 and have spent the subsequent months repressing their opponents. Close observers believe that there is no longer a power struggle in the Iranian government between hard-liners and moderates—if any moderates are left—but rather that power is flowing away from the ayatollahs and toward the Islamic Revolutionary Guard Corps. In other words, Iran is being transformed from a theological autocracy into a theological military dictatorship. And given that the Islamic Revolutionary Guard Corps controls both Iran’s nuclear weapons program and its funding of international terrorism, this means that Iran will only become more dangerous as time goes on. As the failure of negotiations with Iran becomes more obvious by the day, the Obama administration’s next strategy seems to be a reliance on sanctions. In theory, sanctions will take advantage of the vulnerability stemming from Iran’s inability to refine petroleum. But this is the strategy that the Europeans and the Bush administration pursued unsuccessfully for the last seven years. The U.N. Security Council has passed three sanction resolutions, which have had almost no impact whatsoever on Iran’s ongoing nuclear weapons program. Another U.N. resolution is not likely, especially given Russia’s firm opposition. And if Europe and the United States don’t help Iran with oil, Venezuela’s President Chavez has pledged his country will do so. There are really only two scenarios by which Iran can be stopped from possessing nuclear weapons. The first is regime change, which seems less and less likely now that the outrage following the fraudulent presidential election has dissipated. The second is preemptive military force. This is an extraordinarily unattractive option, but the alternative is much less attractive. The Obama administration almost certainly will do nothing militarily, which puts the entire onus on Israel. In the past, Israel has not hesitated to act when faced with an existential threat. It destroyed Saddam Hussein’s Osirak reactor outside Baghdad in 1981, and in September 2007 it destroyed a North Korean reactor in Syria. So the spotlight in the near future is very much going to be on Israel. Toward Israel, the Obama administration’s policy to this point has been an essentially European policy. Its underlying assumption is that solving the Israeli- Palestinian problem will lead to a greater peace in the Middle East. But the real root of the problem in the Middle East is Iran’s continuing support for terrorist groups like Hamas and Hezbollah. Nonetheless, the administration has thus far spent more time and energy pressuring Israel to stop building settlements than pressuring Iran to stop funding terrorism. Here at home, the Obama administration has gravely impaired our capability to gather human intelligence by declassifying hundreds of pages of documents that explain our interrogation techniques—information that is now probably in al-Qaeda training manuals. And at a time of the grossest profligacy in domestic spending in American history, the administration has imposed a ceiling on defense spending. At the same time it advocates an $800 billion stimulus plan that seems to include every idea ever hatched in Washington, it is making radical cuts on missile defense and cancelling the F-22 fighter aircraft. It supports a deposed president in Honduras—deposed, in accordance with the Honduran Constitution, for attempting to subvert the Constitution as his thuggish ally President Chavez did in Venezuela—against its legitimate government which promises a free and transparent election. The list goes on. And even where the administration has pursued sensible policies, it has only done so grudgingly, and with the clear understanding that, absent political constraints, it would have done things differently. I understand that Americans are concerned about the economy. And I understand that every new president is going to have domestic priorities. But our adversaries around the world are not standing idly by while we debate these domestic issues. Our current focus on health care is very important, but people like Kim Jong Il don’t care about it. We need a president who is going to provide us with leadership in international affairs—not one who believes that America should simply come home. And we need a president who believes that the best place to defend our interest is overseas rather than in the streets of America.